LOOK AT THIS CAKE. Dear lord. Okay. First, an origin story. So my friend Danielle M. Friedman, who is Sous Chef at the West & Mill Bistro Bar in Atlanta, Georgia, was pondering dessert ideas one day and I humbly suggested one of my favourites, the Chocolate Stout Cake, but with a frosting that incorporated whiskey in to it as well. 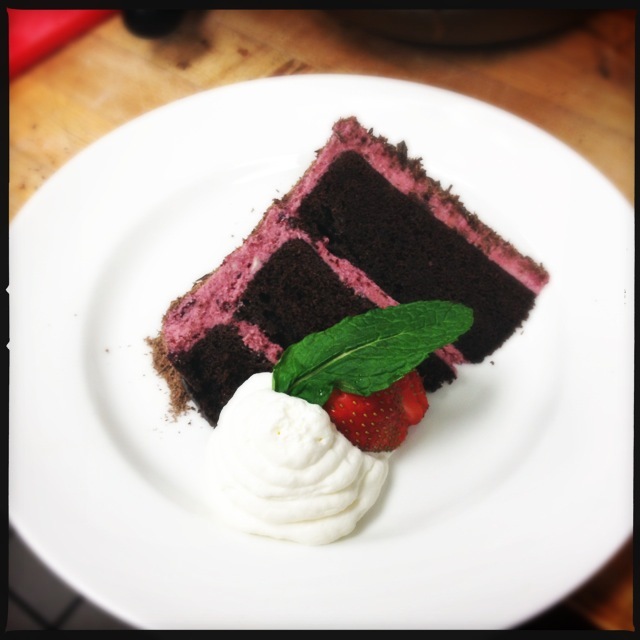 Danielle, of course, was inspired and after a time of perfecting came up with two recipes for Chocolate Stout Cake. One with a caramelized white chocolate and whiskey frosting and another one with port and black cherry frosting (pictured above). Both proved to be a smashing success, selling out within two days. What makes this cake so unique for me is the amount of stout that goes in to it. 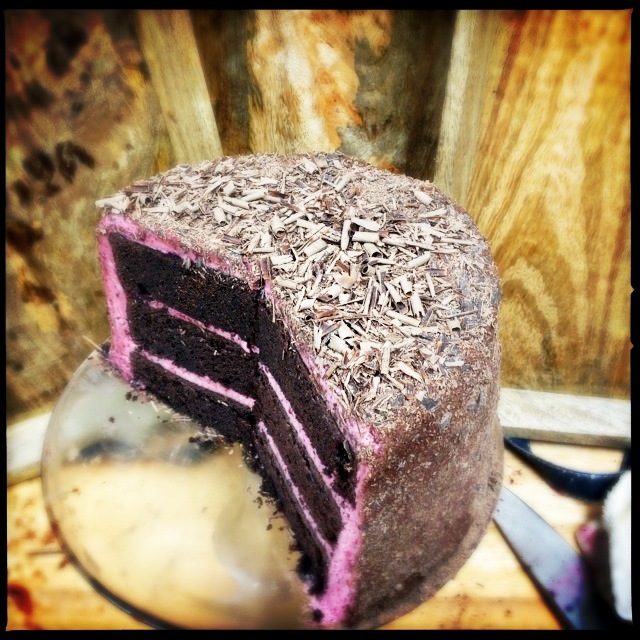 Most stout cake recipes only use about 1-2 cups, which leaves the stout flavour taking a back seat to the chocolate, but this cake feature 2 bottles of stout and according to Danielle, the flavour of the beer is clearly the star of the show. Danielle has kindly passed on the recipe for this gorgeous cake along with the port and black cherry icing and I’m posting them below. Try it out and enjoy! I know I intend to try out the recipe and see how it goes at a potluck. In the meantime, I’m putting West & Mill on my list of places to visit. 3. Whisk flour, sugar, baking soda, and salt in large bowl to blend. In a large bowl, beat eggs, vanilla and sour cream until well mixed. 1. Place cherries, port,and granulated sugar in a heavy sauce pot. Simmer them on medium heat until it reaches the consistency of thick preserves. 3. Puree the cherry port mixture in a blender until smooth. 4. Beat the butter with an electric mixer until smooth. 5. Slowly beat in the confectioners sugar and kosher salt until well blended. 6. Slowly add the cooled cherry mix to the buttercream and mix until it reaches the consistency you desire. You may need to chill the icing before using it.